The Liberator Senior Hand Truck is one of our most popular convertible hand trucks. This well made and versatile 2 in 1 hand truck is a favorite with delivery drivers, warehouse workers and stocking personnel. Proudly made in the USA! Hand Truck frame consists of strong, lightweight aluminum construction. 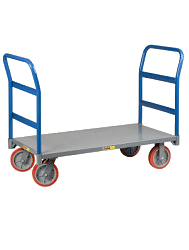 The total hand truck height is 61”, platform handle height is 45.5”, platform bed length is 51”, platform bed height from floor is 10.5”, and the overall length converted is 55.75”, frame width is 12”. Cast Aluminum Nose plate is 14” wide x 7.5” deep, with a recessed heel. FULLY PNEUMATIC 4-PLY 10" A great general-purpose wheel with a 4 ply, 2-piece hub, zerk fitting, and ball bearings. Equipped with our Blue Comfort Grip Strip around the handle. Provides protection to the hands when it's cold outside and for and solid grip. Industrial Solid Rubber 5" x 1.5" Grey Casters with wing brake. Hard Rubber Casters offer great floor protection, are quieter than steel casters, and are strong and chip resistant. Height as Hand Truck: 61"
Base Plate: 7.5" x 14"